« Should the Protestant Ethic Become the Spirit of the Alt Right? It is important for White Nationalists to visualize what victory would look like. There are really two answers to this question. The ultimate answer is our vision of Whitopia, the society we want to create. But before we build Whitopia, we need to achieve a victory over the present political system. This victory will give us the power to create our ideal society, and it may come decades before Whitopia is realized. Victory, like everything, depends on things we can control and things we can’t control. The things we can’t control can be summed up under the rubric of “the historical moment,” which includes all objective social conditions, including unpredictable historical contingencies like the election of Donald Trump. The historical moment can be either auspicious or inauspicious for our plans. The best-organized movement in the world will make no headway if the historical moment is not right. On the other hand, if we do nothing, our plans will never be realized, no matter how receptive the historical moment might be. The things we can control are all the things we can actually do, and for our purposes they boil down to political and metapolitical activism. Political activism encompasses all attempts to gain control over the levers of political power. Metapolitical activism encompasses creating the conditions necessary for political success. There are two branches of metapolitics: organizing a White Nationalist community and propaganda, i.e., creating ideas and media to impart a pro-white worldview. The way that politics and metapolitics work together can be appreciated by considering them in isolation. It is possible to gain power over a society by purely political activity, without persuading the general public of the rightness and feasibility of our ideas. The clearest example of this path is a foreign invasion, in which the apparatus of state is seized, and all opposition quelled, simply by force. Another such model is an unpopular revolution from within, in which an armed militant party seizes control of the state. Such a route is, of course, maximally difficult and costly, simply because victory becomes easier when more people agree with you and fewer people fight against you. Decreasing the numbers of your enemies and increasing the numbers of your friends and allies is the work of metapolitics. It is also possible to gain power over a society by purely metapolitical means, simply by persuading the overwhelming majority of the population that one’s ideas are correct. If White Nationalism became the common sense of a whole society, then one would not need to organize a White Nationalist party and take control of the state, for all the political parties would effectively be White Nationalist. No matter how vehemently the different parties might disagree about issues like taxes, health care, and feminism, white identity and interests would be sacrosanct, and this attitude would extend through the whole of the culture. At that point, from the point of view of white interests, it would not matter what political party ends up in charge, because whites simply cannot lose. This full-spectrum metapolitical dominance is what I call “hegemony.” Hegemony means rule from afar. In politics, a hegemon is a power that dominates subordinate powers without directly ruling them. For instance, the United States is hegemonic throughout Europe and the Western hemisphere, although its clients are sovereign states. In metapolitics, hegemony means a broad cultural consensus sets the parameters of political debate and decision-making, framing every issue in “heads I win, tails you lose” terms, so that no matter what the political outcome, the hegemonic values continue to reign. In the white world today, the organized Jewish community exercises cultural and political hegemony. Thus no matter how divided the mainstream might be on specific issues, it is united in treating Jewish sensibilities and interests as sacrosanct. The goal of the North American New Right is to deconstruct this Jewish hegemony and replace it with a similar hegemony of pro-white ideas. Wouldn’t it be nice, for a change, if white identity and interests were sacrosanct in white countries? In practice, of course, the political and metapolitical paths to power work in tandem. Even an armed takeover by a revolutionary party would presuppose metapolitics in order to create an ideological consensus within the party itself. And even if White Nationalism became the common sense of the the whole society, we would seek to make that victory permanent by organizing to take control of governments and other institutions and oust anti-whites from all positions of power and influence. With these concepts in mind, we can now return to visualizing our victory over the present cultural and political powers, so as to clear the way to building a White Nationalist society. Keeping in mind that politics and metapolitics can never be fully separated, we can still ask if our victory will be primarily political or metapolitical. My answer is: our victory must be primarily metapolitical. To appreciate this point, take a look at the present state of the Trump administration. Through organizational genius and the sheer force of personality, Donald Trump managed to rouse a populist revolt against the entire political, intellectual, and media elite. This revolt placed him in the White House by a razor-thin margin. Although Trump has the loyalty of the white majority, the voters do not exercise day-to-day control over the levers of cultural and political power. Instead, those are in the hands of people who fundamentally disagree with Trump’s outlook and agenda. Trump won a political victory, but in terms of metapolitics, the globalists are still very much in power. Their ideas are hegemonic, and their networks of influence extend throughout society, blocking Trump at every turn. To push his political agenda through, Trump also needs a metapolitical sea change. He needs a community of people who agree with his populist vision, who can win new people to his cause, and whose influence can counter the globalist network. It is our job to create it. Trump, moreover, is a far cry from a White Nationalist. The opposition he faces is nothing compared to what would greet a White Nationalist if, by some miracle, he could be elected President in the first place. A White Nationalist will never attain effective political power in the United States or any other white nation until we change the culture. We have to convince a very high percentage of our people that White Nationalism is both morally right and politically feasible. We also have to convince a significant percentage of those who are ambivalent about us that we are still a legitimate political force, perhaps even worthy political allies. Then we need to convince a large percentage of those who oppose us to do so passively rather than actively. And only at that point will we be able to gain state power and use it to disempower, silence, and marginalize the anti-whites who remain. The metapolitical approach also plays to our strengths. Right now, the enemy has complete control of all the commanding institutions of our society. Their weakness, however, is that their policies are based on false principles, which means they are leading to evil consequences. Beyond that, our enemies have never been more corrupt, venal, stupid, and laughable. By contrast, we have almost no real-world institutions of our own, just shifting battle-lines and outposts on the Internet and social media. Our only real advantage is the truth, as well as the credibility that comes from telling it. But effective policies can only be based on reality, thus we are the only ones offering workable solutions for the problems created by multiculturalism. Beyond that, we really have the best people. Fighting a political battle means pitting our greatest weaknesses against the enemy’s greatest strength. That is a losing strategy. Fighting a metapolitical battle, however, means using our greatest strengths to attack where the enemy is weakest. Only after attaining broad metapolitical hegemony will we be able to muster the resources to take control of actual institutions. This analysis has forced me to confront a contradiction in my own thinking. I have long maintained that White Nationalism will never triumph until it leaves the Right-wing ghetto and becomes the common sense of the whole political spectrum. There needs to be a racially-conscious Right, a racially-conscious center, and and a racially-conscious Left, and we know this is possible, since such things have already existed throughout the white world. For instance, America’s Asian exclusion movement, South African Apartheid, and the White Australia policy were all supported by the racially-conscious Left. Nevertheless, I am quite comfortable in the Right-wing ghetto. Honesty compels me to be a man of the Right, since I believe that there are values higher than equality and individual liberty. But although I am a man of the Right, I am not a Right-wing sectarian. I want the White Nationalist idea to leave the Right-wing ghetto and redefine the whole political spectrum. Right-wing sectarians, however, seek to confine White Nationalism to ever narrower reaches of the far Right. Right-wing sectarianism is a self-marginalizing, self-defeating tendency, and it could not come at a worse time, for the historical moment has never been more receptive to white identity politics. More people are looking to us for answers than ever before. We must develop new platforms, spokesmen, and messages to try reach and convert every white group: every age group, every social class, every religion, every ethnic group, every interest group, every subculture — everyone. This is how white identity politics will attain complete cultural and political hegemony. But instead of outreach, the movement is turning inward. The problem started last fall, just before Trump was elected, with the Alt Right “brand” war. Large numbers of half-baked civic nationalists and cultural libertarians suddenly started calling themselves “Alt Right,” because they supported Trump and wanted to distance themselves from movement conservatism. I saw this as an opportunity to embrace, not a threat to repulse. After all, you can only convert people to White Nationalism who aren’t already White Nationalists, and you can only convert them if they are willing to listen to you. And, for a time, they were willing to listen. The Alt Right “brand” was a White Nationalist entryist and outreach project from the very start. But the Alt Right worked best for White Nationalists by not being exclusively associated with White Nationalism. Normies would never try the Alt Right on for size if it were an exclusively White Nationalist movement, much less associated with people like Nazis and the KKK. The Left, of course, understands the power of such associations to freeze thought and action on the Right, which is why Leftists trot them out time and again. Some White Nationalists, however, were more concerned with exerting control over a “brand” than outreach to the public. So they hit on the same tactic as the ADL, SPLC, and mainstream media: to chase people away from the Alt Right by associating it with Nazis and the KKK. The best example of this is the troll campaign against Steven Crowder, who made the mistake of calling himself Alt Right, and was rewarded with a storm of memes in which he was welcomed to the ranks of Nazi extremists. It was hilarious, vicious stuff, but completely self-defeating from the point of view of outreach and conversion. After Heilgate, the Alt Right was forever identified not just with White Nationalism, but with Nazism. This led to a split between the Alt Right and the Alt Lite. The Alt Lite consists of civic nationalists who are explicitly opposed to white identity politics. Instead, it is the Right-wing identity politics of white race-mixers, non-whites, and diaspora Jews. The Alt Right has increasingly adopted the ideas, images, and ethos of neo-Nazis and White Nationalism 1.0 (e.g., skinheads and the National Alliance) and is rife with purges and schisms as different factions seek to create a smaller, weaker, dumber, and more “pure” movement. Both Alt Right and Alt Lite are at each other’s throats, but they do have one major thing in common. They are equally incompatible with white identity politics breaking out of the margins and redefining the cultural and political mainstream, which is precisely how I define victory. In the sequel to this article, I will explore how to get beyond Right-wing sectarianism. Published: August 4, 2017 | This entry was posted in North American New Right and tagged articles, Greg Johnson, hegemony, metapolitics, North American New Right, originals, Right-wing sectarianism, the Alt Light, the Alternative Right, vanguardism, white community organizing, white nationalism. Both comments and trackbacks are currently closed. Do you think that superhero movies are good for creating a pro-White metapolitical structure? Even with the tokenism that is forced into them they still promote a world view based on innate, genetic, power and the exceptionalism of mostly White individuals. Yup, and unfortunately the paranoid 90’s survivalist wing(RaHoWa Apocalypse, I call it) is coming back with a vengeance in some parts. It’s very sad because the current iteration of the WN movement had done so well up till now–we made so many metapolitical gains–because of our intellectual vigor and smart humor. Apocalyptic Militia types and humorless 1.0 RaHoWa larpers, at minimum, are like repellent to sane people and at worst are literally quite dangerous; they need to be avoided and cut-off at all costs. Hey, that cartoon at the top really hit home. I love Tuvan Throat singing and I’ve gotten into some pretty heated debates about tipping. I completely understand that Greg – and most who comment here regularly – identify first and foremost with their genetic nation. To my mind, that is the single highest value and political priority, period. I also understand that most here identify with the historic ‘right’ – and while I don’t buy for one minute the economic claptrap peddled by the right for the last 50 years – I feel far more aligned to the nationalists of the alt-right than I do to globalist SJW’s, antifa and others of the so-called left. Spreading the nationalist message as far and wide as possible is essential to our success. If you like your right wing values and economics, well, that’s just fine. We can debate that stuff after we’ve secured a future for our kids. Today, we need to unite around our nationalism in opposition to the globalist hegemony. Thanks Leon. When you talk about leftist principles and policies that people abhor, I imagine that you’re talking about the kind of post-modern cultural gibberish promoted by the SJW left. If so, I agree. These ideas are repugnant to most – and are inconsistent with genetic nationalist ideas anyway. But, on the other hand, there is an economic ‘left’ position that I believe aligns completely with the same people who are most likely to support white nationalism. These are the people who have been racially and socially screwed by the left since about 1970 – and who’ve been economically screwed by the broad ‘right’ at exactly the same time. Policies of labor market deregulation, union busting, wage ‘restraint’, lower taxes for corporations etc have benefited Wall Street and the big end of town, but have hurt blue collar workers. I may be wrong, but my sense is that white nationalism will be less attractive to those who are materially well off. If we are to sell nationalism to normies (already difficult, given the conditioning of past decades) I can’t see how it will be easier if they’re bundled with ‘right’ economic policies like austerity, which favour corporations and the (((1%))) over lower and middle class white employees. I’m not so sure. The Right may have constituencies based around the social issues you list, but what about the economic ones? In my view, those most likely to come over to ethno-nationalism are those who have not benefited from the economic ‘reforms’, driven by the right, over the past 30 years. Austerity, tax cuts for corporations, wage restraint, casualisation, outsourcing, private health care etc – all the economic hallmarks of the economic right – have benefited the 1% but haven’t really helped the white working class so much. It’s difficult to imagine how such policies will help win over normies who, as you correctly point out, will focus on what’s in it for them. Right winger: Hey Normie, I’m here to tell you about the advantages of an ethno-state. No more mass immigration, no more multiculti rubbish, just a nice, white country. Normie: Well gee, that sound nice. I like the sound of that a lot. But my wages flatlined in 1989, my wife has lupus and can’t get health cover, the bank is threatening to foreclose and I’m holding down three jobs to make ends meet. Can you help me? Right winger: Gee, sorry pal. That’s all your own fault. You need to embody the animal spirit of capitalism and pull yourself up by your bootstraps. Tighten your belt, read some (((Ayn Rand))), become an entrepreneur!! Normie: Oh, ok. See you later. Right winger: But wait! Don’t you want to hear more about the ethno-state? Thanks again Leon. And apologies for my duplicated last response – had some issues with my device, thought I’d lost the first reply but clearly not. It might be that our different nationalities contribute to our different experiences. Australia has never had the same fervour for free enterprise and small government as the US. We were also never locked directly into a Cold War with the USSR (except at times as proxies for the US). In addition, a nation founded by Puritans is going to have a different cultural outlook to one founded as a penal colony. Ideally – and as Greg has said elsewhere – we’d see nationalist ideas achieve hegemony in society, among white people regardless of whether their economic policy preferences tend left or right. For now, the best tactic might be to separately pursue nationalism aligned to different economic agendas, to avoid alienating potential support at either end of the economic policy spectrum. Is it possible Celine was right when he said white civilization died at Stalingrad? The more I read and think about our situation the more pessimistic I become. I think Heidegger was right. Only a God will save us. Where does Celine say this? I’m not challenging u, I just want to read more of what he said on the topic. Here’s a snippet from an interview published in the Paris Review, Winter-Spring 1964. Céline died in 1961 and I can’t find the French original on the inter-net. So I don’t know when the interview actually took place. INTERVIEWER: And for you the tragic in our times? Europe. There was a cataclysm. The core of it all was Stalingrad. There you can say it was finished and well finished, the white civilization. So all that, it made some noise, some boiling, the guns, the waterfalls. I was in it … I profited off it. I used this stuff. I sell it. Evidently I’ve been mixed up in situations—the Jewish situation—which were none of my business, I had no business being there. Even so I described them … after my fashion. The best of the German army perished at Stalingrad, needlessly so, for it was the wrong battle at the wrong time. Our moral and material retreat from there has continued unabated, so I see no justification for the false optimism presented in the article, as if a WN utopia were only beyond the horizon ready to be grasped. It is no exaggeration to say we are fast approaching the abyss of extinction, perhaps not in North America, but with terrible certainty in many regions of Europe. Only the most fanatical and heroic of sustained efforts will save us. Perhaps there will be some providential or divine input but don’t count on it. During WW2, the Germans were almost constantly worried that the Soviets might start using chemical or biological weapons, and particularly so, when they had the Soviets on the roll and approached Stalingrad in summer 1942. I have a very strong interest in WW2 military history and have read a lot of the German army’s surviving military documentation (many of the materials that were captured by the Americans at war’s end, microfilmed and stored at NARA, can be found online now) and there is nothing indicating that there was actual chemical or biological warfare in action. Cochran here unfortunately relies only on Beevor, who is a journalist rather than a historian and writes books that are, though popular, taken entirely from other military sources, filled with misunderstandings, and from a historiographic point of view, almost worthless. “ Did we back the wrong candidate in France? Is Emmanuel Macron—dare I say it—“our guy”? It is a strange “conservatism” that welcomes reckless procreation and dismisses an awareness of limits as “liberal.” And yet Mr. Kaufman and Mr. Macron’s other critics are reacting to something real. The French president’s suggestion that African women are breeding like animals and must be restrained by an enlightened elite awakens primordial terrors in the hearts of the mainstream Left and Right. I am getting a strong “secret agent” vibe from Macron, and feel that he is much more “our guy” than Trump, Bannon, Farage, Le Pen, Orban, Putin, etc., for example. Of course, he would never in a million years admit to that, and that is absolutely fine with me, because it would just unnecessarily blow his “secret agent” cover. “This might be controversial to some, but I truly believe, that the Alt Right’s “true” allies are more on the left of the political spectrum than on the right; however paradoxical and contradictory this might sound and appears to be. Trying to convert conservatives is a waste of time, in my opinion. They will either voluntarily join the cause, or not. The majority of (secret/clandestine) missionary work and efforts should be focused on the Left, in my opinion. I think Macron believes he is the new Sun King, whose counsel is beyond the ways of men, even the ‘enlightened’ Eurofags in Brussels. Another explanation is the powers that be realize gradualism is still required to achieve their ultimate aims. Hence, they may be prepared to crackdown on the most extreme forms of their project. There is a hidden danger there for us. I for one think the mass infusion of refugees into Europe is a huge mobilizing force for the right, because cause and effect are clear for all but the willfully blind to see – you can’t have Europe while replacing ethnic European populations. “French President Emmanuel Macron said Thursday he wanted to create “hotspots” in Libya this summer where migrants would be pre-screened for asylum claims, an announcement that sparked concern from Human Rights Watch (HRW) and a number of NGOs. This was clearly a more vague speech than his surprising statements to the press a few minutes earlier. “To help square this with his conscience, I suggested that he see himself as a secret agent, as a disciplined political soldier. When James Bond is under cover, he doesn’t reproach himself as a coward for not revealing his true identity. He just thinks of his mission, of his duty. A secret agent does not lie out of cowardice, but out of strength and self-overcoming. He suppresses any self-indulgent frankness for the greater good. Yes, we need more explicit White Nationalists. But if you cannot be one, don’t reproach yourself as a coward, don’t create an inner conflict that exhausts your energies and may lead you to self-destructively blurt out the truth in a moment of mere weakness and self-indulgence. You may be right. Or we may have dodged a bullet; there was a chance back then the Alt-Right brand was going to be taken over by “edgy” conservatives or even by lamestream neocons. I think you are correct. I think the Alt Right movement and their/our brand dodged a massive cannonball. “High-level representatives of both the Alt West and the Alt Right peacefully coming together, calmed the waters and prevented animosities, caused by Milo Yiannopoulos’ irresponsible and conniving behavior, to spiral out of control. Much respect and gratitude to Mr. Day and Mr. Johnson for this important diplomatic effort to keep the two most important factions of the Dissident Right on friendly terms. I also want to give credit to Andrew Anglin for countering Milo Yiannopoulos’ intrusion into and attempted co-option of the Alt Right movement. Even though, I don’t fully agree with all of Andrew’s methods, the harsh language and imagery he uses in his propaganda efforts, and his hypervigilance, I personally feel, that he and the Daily Stormer are a net-positive for the Alt Right movement, and I appreciate his efforts and highly respect and honor his personal sacrifices in the defense of White and Western Civilization. “I just want to remind everyone how massive a feat it was to keep people like MILO and #RatfuckerJack from stealing our Alt-Right brand and all of our symbols. That came very, very close to happening. I was the main guy sounding the alarm, and was actually pissed off at Richard Spencer for not doing enough to protect it – and in fact flirting with MILO (I don’t mean that in an implicit way). But we should always remember our victories. And that was a big one. But if you understand what Greg is saying, you would see that we should not even have a brand. We should not have symbols. This is why you don’t see Pepes and Kek anywhere on this website. Pepe is the alt-right ghetto. So is Kek. So is everything on the iceberg in the featured picture. We intend to get out of the ghetto. We don’t want Pepe, we want it all, the universities, the schools, the churches, the government, the rock music, the classical music, the techno music, the cartoons, the news, the action movies, the documentaries, the soap operas- all of it. I remember reading the articles from the journalists who went to NPI. When the media arrived at Richard Spencer’s NPI conference, they initially had an impression of fear they had at the sight of well-adjusted, classy-looking white nationalists. Perhaps, they thought, we could actually do some real damage. Good! That is how it should be! But they then were disabused by the sight of the weird inside jokes being passed around and stupidly laughed at, saying it looked like a meeting of Trekkies. We do not want to be that. We do not want to be “alt-right,” if that is what Richard Spencer is saying it is. We want to be Europe itself, and at least part of what is now defined as America, Canada, and Australia. I completely agree with Good Samaritan’s comments. I could not have said it better myself. 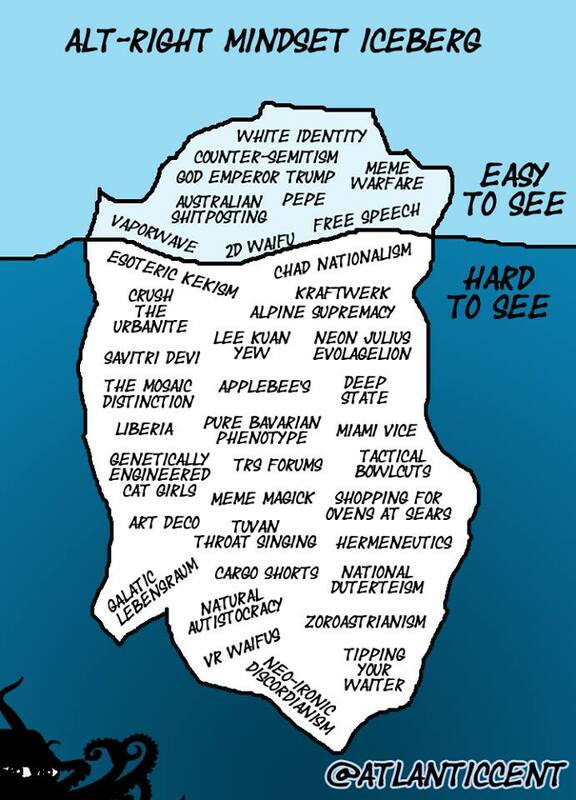 yeah the altright was supposed to be what anthropologists call a ‘liminal space’, an ambiguous and chaotic zone where currents of genuinely far-right thought could gain legitimacy as part of a broad discourse. The left offers an increasingly anti white platform characterized by BLM style race politics, impending amnesty race replacement immigration and a general dispossession, economic constriction, and spiritual abnegation of white European people. This is the preferred option. The right is only able to gain media access by commitment to radical Zionism culminating in hot wars in the Middle East as in the case of W bush in Iraq and McCain(bomb bomb bomb Iran). These candidates may not challenge the race replacement immigration policy which is sacrosanct, and may in fact be favored by big agriculture and certain other capitalist lobbies, although this may be a deflection as in the “no war for oil” leftist meme about Iraq. It’s really those evil white corporations. A brave patriot Donald trump was spurred to use his great wealth and celebrity to break the grid lock and win the presidency. It is unclear whether he had the abstraction to see the power that is aligned against him. Trump’s platform violates two sacrosanct principles a) ceasing illegal immigration from Mexico and certain Muslim immigration, which are baby steps in slowing the replacement of whites by immigration and B) opposition to war in the Middle East which was the only way a republican or centrist democrat could get any room to breath. Violation of these principles is the cause of the unprecedented media and deep state opposition to Trump. The alt-right, as a public phenomenon (and not just a network of edgy post-paleoconservative blogs), was largely a product of Trump’s presidential campaign. He was the attractive and sustaining force that for once bound together the usual collection of otherwise obstreperous micro-factions that constitute the far right (or what the mainstream designates as ‘far right’). After his assent, the energy focused on installing him started to disperse, and with it unity of purpose. Now we’re regressing to the mean of factional infighting, purges, and personal vendettas. Fighting each other always seems momentous, because from the perspective of little tadpoles, a storm in a tea-cup is a really big deal. To break out of the metapolitical eddies, we’re going to need to internalize the meme we’re fighting for a zeitgeist rather than a set of Pharisaic policies. Accentuating fundamentals is the only way to break into the mainstream. But for the cognitively bereft, adopting wholesale models which dictate how one must think about everything (one is reminded of John Cleese shouting ‘[Orders] – orders which mus be obeyed at all times!’) is far more appealing. Ergo, unreconstructed Hitlerists purging ‘cucks’ who support Zionism on ethonationalist principle, or the ‘white sharia’ crowd doing their best to drive women away for no good reason. My solution is reaffirming we want quality, not quantity, and using networking to create the platform to launch an aristocratic elite into the commanding heights of the socio-political economy to alter the metapolitical playing field. If the Jews did it, why can’t we? Perhaps the real value of the alt-right – its ‘inner greatness’ – has been (hopefully) the exponential formation of real world connections. At other times. we’ve been told by leading Alt Righters that the Alt Right IS White nationalism (and vice versa), an equation vehemently opposed by some on the Far Right who dislike the Alt Right brand. The Alt Right has to be one of the most ill-defined political brands in American history.